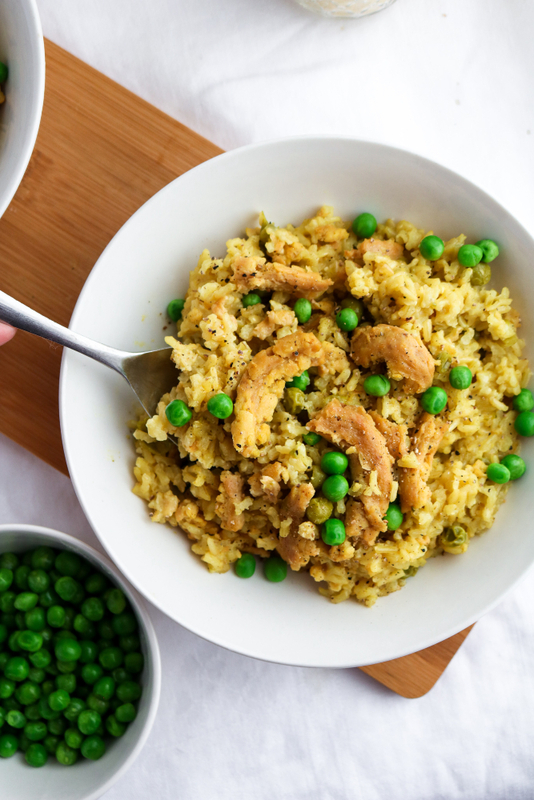 This easy slow-cooker vegan chicken and rice is classic comfort food made vegan! Great for a busy weeknight or meal prep session, it’s also healthy, gluten-free, and can easily be made oil-free. Basically, it ticks all the boxes for a go-to dinner recipe! This slow-cooker vegan chicken and rice recipe is our latest installment in the series of recipes inspired by our favorite homemade veggie bouillon. And my oh my, is it a good one! Cozy chicken(less) comfort dishes have totally been our jam this winter. If you’ve spent any time around these parts recently, this is a fact of which I’m sure you’re already aware! From our Creamy Vegan Chicken(less) Stew to our Vegan Pot Pie Casserole, there is no taste that quite warms our frost-bitten hearts more than those thyme, turmeric, and onion infused classics. And given these are some of the most popular recipes on our site, it seems like you agree! These dishes are part of a collective nostalgia many of us experience. These flavors are part of our childhood, and it’s so much fun to bring them back into our lives (and yours!) in a modern and totally vegan way. This slow-cooker vegan chicken and rice recipe is actually something I’ve been making for a few months now. Since we almost always have some frozen veggies, soy curls, bouillon, and dry rice around the house, it quickly became my go-to “we have no food in the house ” lunch. It was so simple I didn’t really think anything of it, until I shared some of my leftovers with T one night. He RAVED about the stuff, and sure enough, I get a text the next day requesting chik’n + rice for dinner. This is the first *true* slow-cooker meal we’ve posted to the blog and therefore a whole new level of easy! Simply dump 6 ingredients into your slow-cooker (we use this one), turn it on, and in just under 3 hours, your house will be filled with the most comforting, familiar, and tantalizing smells you can imagine. I still laugh how this scent literally calls to T + me. Any time I’m cooking this slow-cooker vegan chicken and rice, I don’t even need to announce when dinner is ready. The smell just pulls us in for a nice warm hug, and before we know it, we’re both gathered around the slow-cooker sneaking the first bites as we clamor around for bowls and actual utensils. It’s a beautiful thing. This would be a great meal prep recipe or weeknight dinner – especially if you have a family to feed! The recipe makes about 6 servings that hold up well when stored in the fridge for up to a week. It’s kid-friendly too! 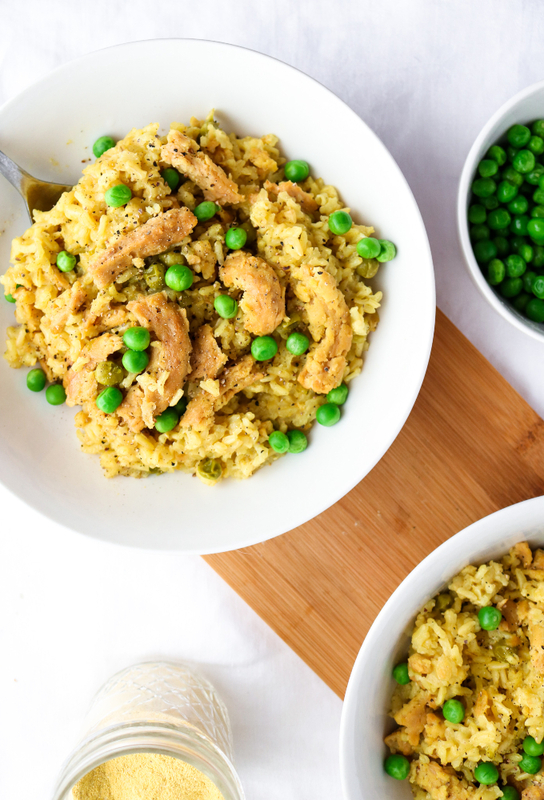 No matter how or why you make this slow-cooker vegan chicken and rice, we’d totally love to hear how it goes! You can rate the recipe and leave a comment below or tag us in your delicious photos on Instagram. If you’re not already following along, we’re @theplantpowercouple with the “the”. We hope you find this recipe every bit as comforting and delicious as we do. Cheers! 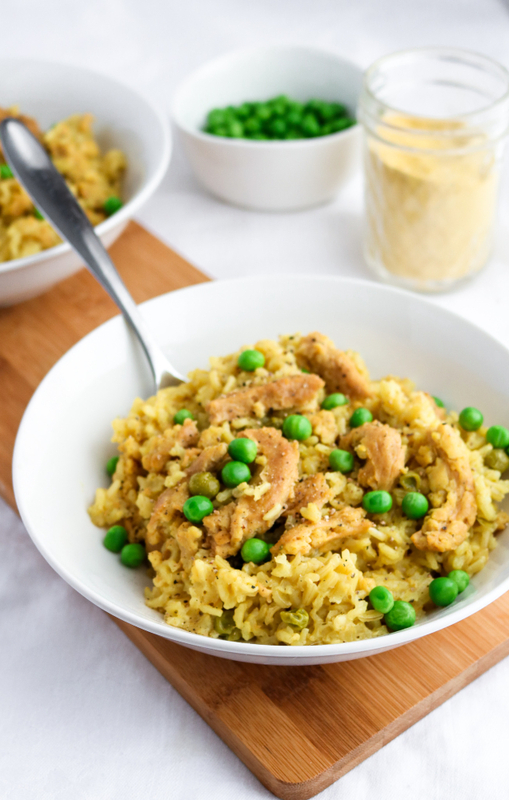 This easy slow cooker vegan chicken and rice is classic comfort food made vegan! Great for a busy weeknight or meal prep session, it's also healthy, gluten-free, and can easily be made oil-free. Add all the ingredients - except the soy curls - to your slow cooker. Stir, cover, and turn on high. Let it cook (without removing the cover) for 2 hours. When time's up, add your dry soy curls, stir, and cover once more. Let it cook another 30 minutes on high. Finally, turn your slow-cooker off, stir, cover, and let it sit 15 minutes before serving. Taste and adjust seasonings as needed. We like to top each bowl with some extra peas and some freshly ground black pepper. Enjoy! *I like to measure my rice into a fine mesh strainer and rinse in cool water before adding it to the slow cooker. This is supposed to help remove some of the starchiness, and I do see a big difference in the texture of the rice when we do this! **You can use any vegan chik'n you prefer, but if you're using something that does not need to be rehydrated, you may want to reduce the water by at least 1/2 - 1 cup. If you're making this recipe gluten-free, be sure to use gluten-free chik'n here. Cooking times can vary depending on what kind of slow cooker you have. We use this one.